Backpacking Background: I have been camping and hiking for as long as I can remember, but I've really only been backpacking for a decade. I started off in the hills of northeastern and central Pennsylvania, have hiked trails from Maine to Georgia, and now I am exploring the incredible terrain of the inland northwest. I seldom do trips longer than three days, with most trips being overnighters. I do not own crampons, an ice axe, or a climbing harness, so if the route is technical enough to require them, you won't find me there. I simply like to walk in the woods. MontBell's U.L. Comfort System is a series of sleeping accessories designed to work together in various ways. One of the ways they have been designed to work together is through the "Quick Connect" system, which is a way of connecting all of the above products together in various configurations. More on this below. The main pad (product #1) is a self-inflating air mattress that is available for purchase in four different lengths, which allows for more versatility when planning a sleep system. The Extension Pad (product #2) is a small closed-cell foam pad for . . . well, I'm not sure what it's for. That's part of what I plan on finding out during this test. I imagine that it can be used to add to the length of your pad, for one. 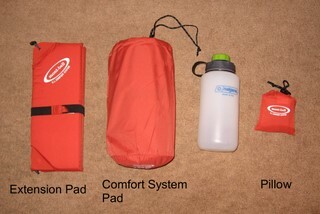 The pillow (product #3) is an inflatable nylon pillow that can connect to the sleeping pad. These are not complicated products; hence, the instructions are brief and simple. However, there are few unusual features, described as follows. 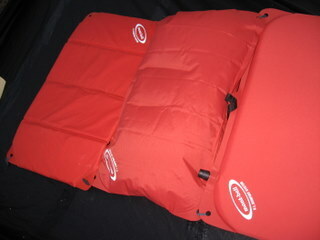 The main sleeping pad has a strap at the head for securing a pillow to the pad. This strap is visible in the picture above. The strap is also used to secure that pad in a roll when compressed for travel. Though the instructions don't mention it, the website mentions that the strap allows you to fill the pad's stuff sack with clothes and then lash it to the pad for an ultralight pillow option. 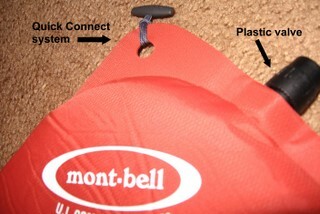 A helpful cutaway picture demonstrates the "tube construction" of the main sleeping pad. This eliminated the side seams, which MontBell claims resulted in a lighter and more durable pad. Judging by the way the pad rolls up, it appears to be constructed of three or four of these tubes. The picture to the below shows a close-up of this system. Basically, each corner of all three products is a flat piece of heavy-duty nylon with a hole punched in it. Every other corner has a connector tied to the hole. To connect any two of the products, you simply push the connector from one corner through the hole on the other product's corner. As per the instructions, the sleeping pad did not self-inflate at first, since it was super-compressed from the factory at this point. So I had to blow it up the first time. This did not take long and in no time the pad was inflated. Next, I inflated the pillow. This is not a self-inflating piece, so I had to blow this up too. Again, it cost little effort or time. 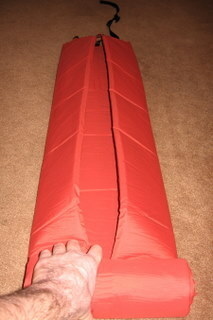 The extension pad does not inflate or deflate; it folds up accordion style. So I had the extension pad ready to go in about two seconds. I figured I would get right to it and try out the Quick Connect system. First, I joined the extension pad to the foot of the sleeping pad. No problem. The system is simple and easy. The connector slips through the hole easily enough, but it is just tight enough that it seems secure. In the picture to the right, one corner is connected and the other is not, just to illustrate. Next, I connected the pillow to the head of the sleeping pad using the pillow strap. Again, quick and easy. I had my sleep system inflated, assembled, and ready to use in about seven minutes. Not bad for the very first time using it. Finally, the most important part: lying on it. It felt comfortable at first, but I noticed that my feet did not reach to the extension pad at the foot. Hmmm . . . will it even be necessary for me? Well, apparently not for this configuration, but perhaps something will come up. The pillow seems rather comfortable, and it is constructed in such a way that it is slightly thicker on one end, so this offers me some options for comfort / preference. Also, experimenting briefly with the air pressure produced even more versatility. The sleeping pad itself was pretty plush when flat on my back, but every time I moved, some appendage or another would push through the pad and make contact with the floor. This will bear further testing; I'll be paying close attention to this. One other thing about the sleeping pad: as mentioned above, the instructions say that the first time you inflate it, it must be done manually. Then, you should let it sit inflated overnight to regain its full thickness. I did this, and then deflated it again the next day to see the difference. Well, there was no difference. I opened the valve expecting it to self-inflate, but alas, nothing happened. I had to manually inflate it again. So this too will bear further testing. These products make an interesting sleep system. I look forward to experimenting with the various products and configurations to see what works best for me. Check back in two months to see what I came up with. MontBell's U.L. Sleep System has gotten a lot of use during this test period. It has been with me on four backpacking trips and one car camping trip, for a total of seven nights. 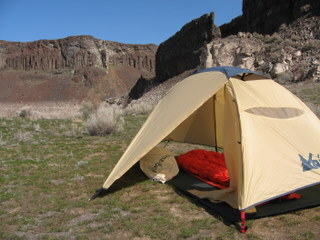 My first night on the sleep system was during a one-night car camping trip to Steamboat Rock State Park, below the Grand Coulee Dam on the Columbia River. Conditions were dry and cold, down to about 24 F (-4.4 C) at night. Elevation was 1500 feet (457 meters) at our campsite on the water. This was my first backpacking trip with the sleep system. The terrain is high desert, with a few lakes interspersed throughout two coulees. Despite the sun and relative warmth during the day, it was pretty cold at night, dropping below freezing to about 30 F (-1 C). Elevation at my camp was 800 feet (244 meters). 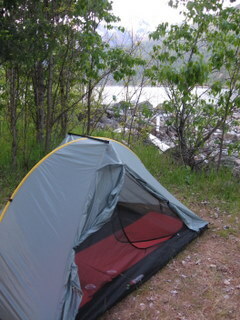 I had the sleep system with me for a three-day / two-night backpacking trip along the Snake River in Hell's Canyon. This is also a desert-like environment; that is why I was here so early in the season. Again, despite the warm daytime temperatures, it got cold at night: around 35 F (1.7 C) both nights. 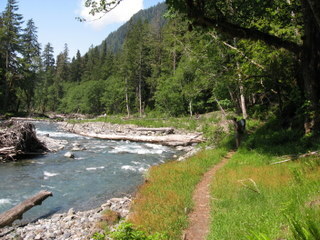 Elevation for our camps along the river was 1200 feet (366 meters). the water, at about 1150 feet (351 meters). The weather was perfect: sunny and warm with a cool breeze. Nighttime temperatures hovered around 45 F (7 C). One last quick overnighter to finish out the field testing period. 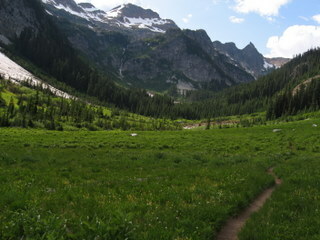 I hiked a few miles up the canyon containing Thirteen Mile Creek to camp at about 3000 feet (914 meters). The weather was great; I don't think it got much below 50 F (10 C) at night. I was more than adequately warm on all of the above trips while sleeping on this pad. I was also using a 15 F (-9 C) sleeping bag, even when the temperature was nearing 50 F (10 C). That being said, warmth was never an issue: I was comfortable on the first trip of the year when it was coldest, and I was actually too warm on the last trip. Comfort was adequate, but not outstanding. The pad does a very good job of absorbing sticks, stones, and various other detritus found on the forest or desert floor. I was very comfortable in that regard, and it was a huge improvement over my closed-cell foam mat. It kept me off the ground when I slept flat on my back, but I can't lie like that forever. When I tried sleeping on my side or face-down, various parts of me would sometimes push through the pad and touch the ground: my shoulder, an elbow, etc. This was not a problem as far as warmth is concerned, but it was definitely detrimental to comfort. Inflation and storage are two areas where this pad shines. Despite my initial uncertainty, this does indeed self-inflate, at least most of the way. It takes awhile; I'm not sure of the exact time, because it takes so long that I always forget about it. But when I get to camp, I unroll it, throw it in the tent, and in a couple of hours when I'm ready to turn in, four or five big breaths are enough to finish inflating it. The valve is a little tough to work at first. It may seem simple, but it's not. The pad needs to be filled tightly in order to keep me off the ground, so I try to force as much air in as possible. But when I get to the last breath or two, it is nearly impossible to keep the air in the pad while I inhale, even if I keep my mouth on the valve. For some reason, the valve will leak air no matter what until it is screwed shut. An annoyance, but a minor one. When it's time to pack up camp, the pad rolls up nice and small and has no trouble fitting in my pack. The attached strap is useful for keeping the pad rolled tightly when it is packed away. I was a little skeptical of this thing at first. What is it good for? What can I possibly use this for that will make it worth the weight and space in my pack? Well, the answer is: a great number of things. This piece of the sleep system has been a pleasant surprise. Since I have been carrying this for field-testing, I have found it to be a very useful and versatile piece of equipment. First of all, it is a handy seat. When it is cold, it is a bit of insulation between you and whatever you're sitting on. When the surface is hard or uncomfortable, the pad provides a little extra padding for additional comfort. During one trip, a light but steady drizzle fell as we huddled around the fire in the evening. I was glad to have the pad then, because it provided me with a warm and dry place to sit. Whenever I got up, I would fold the pad in half to keep one side of it dry. Then when I returned, I unfolded it and had a dry seat. As part of the larger sleep system, it is nice to have the many options it offers. On really cold nights, I put it under my pillow to offer some additional insulation there. In these instances, I would attach it to the top of the pillow, and then fold it back underneath, as illustrated in the picture to the right. As it warmed up and additional insulation under my head was no longer necessary, I attached it to the bottom to support my feet, since they hang off the bottom of the sleeping pad otherwise. One last thing. During the car camping trip, I spilled some beer on it. When I got home, I just wiped it down with a wet, slightly soapy rag and rinsed it with water. Like new. So it has been durable and easy to clean, too. I had never used an inflatable pillow before, thinking they would probably be unbearably awkward. But I'm glad I have this one. It is certainly not as comfortable as a nice big foam pillow, but it is pretty comfortable in its own right. And for the space and weight it saves, it is more than worth the trade off to me. Air pressure is key. I only inflate it about half full of air. That way, it has some give and some softness. Also, since it is just nylon, it can get clammy and uncomfortable on bare skin. It helped tremendously to wrap an article of clothing around it for an improvised pillow case. As noted above, in colder conditions, I needed some additional insulation under my head, since the pillow is just one big empty chamber of air with pretty much no insulating ability. With all of the above considerations, the pillow is quite comfortable. And considering the tiny amount of space it takes up in my pack and its minuscule weight, it is the best pack pillow I've used. Overall, I'm really happy with the sleep system as a whole. It offers an excellent comfort to weight to space ratio. 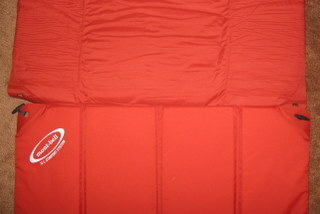 The combination of the shorter sleeping pad and the extension pad offers flexibility not possible with typical full-length pads. Add the pillow to the mix, and my sleep system is customizable and versatile. I can leave pieces home when not needed to save weight or space. I can adjust how I connect the pieces to respond to conditions. Yeah, the pad could be more comfortable, but then it would be heavier and bulkier, too. It's not a bad compromise as is. - uh . . . ugly orange color? I have used the sleep system six more nights during the long-term test. I spent three nights on the sleep system during my trek along the Quinalt River in the rainforests of the Olympic Peninsula. The weather was warm and pleasant, with some humidity but no precipitation. Temperatures at night did not fall below 45 F (7 C). Elevation was low along this coastal valley, topping out at around 2000 feet (610 meters). 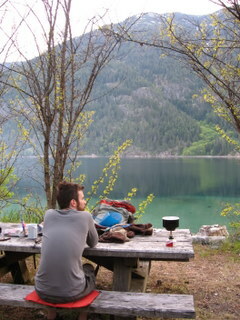 I spent one night on the sleep system on the shores of St. Regis Lake, near the Idaho / Montana border. This lake sits at 5500 feet (1670 meters). The weather was hot during the day and pleasant at night, dropping to about 40 F (4.4 C). Finally, I slept on the sleep system two more times while camped out in the meadows below Spider Gap. Camp was at the high end of the meadow at around 4800 feet (1460 meters). Once again, I lucked out with perfect weather. At night, temperatures hovered around 45 F (7 C). The sleep pad has continued to perform as it did during the field test. No leaks have developed, and it still maintains air pressure through the night. During my trip to Spider meadows, we camped in the same place two nights in a row, meaning the pad was inflated for two days. It did not leak at all and did not need even one breath of reinforcement. One thing I have noticed is that the foam inside the pad seems to be losing loft near the foot of the pad. After it is done self-inflating, the foot of the pad is noticeably thinner than the rest of the pad. I would guess that this is because when I roll the pad up to break camp, I start the roll from the foot and so compress that end rather tightly. After four months, this seems to be taking a toll on the foam in that area. Since this is the area where my feet rest, I have not noticed any appreciable loss of warmth or comfort and it does not seem to be a problem. Otherwise, the pad is in great shape and seems to be holding up well to the rigors of the backcountry. This thing continues to impress me with its utility and versatility. I have taken to using it as a flat, stable and (somewhat) clean surface on which to insert and remove my contact lenses. This is a great convenience when the only other alternatives are rocks and logs. It seems to be tough, too. It has been covered in sap, exposed to rocks and sticks, and even doused in beer (see Field Report), and it is still holding up. All stains have washed off and there are no rips or abrasions. Again, my experience with the pillow has been consistent with my experience during the Field Report. It is comfortable, adjustable, and seems to be holding up well. Life is not too hard on the pillow, since it spends all of its time either in my pack or in my tent, so it should be in great shape, and it is. Works well in a hammock, too. Overall, the sleep system has been a comfortable and durable system that takes up little space in my pack. Comfort is adequate, but not great. But for me, the light weight and compressibility make up for it . Thanks to MontBell and BackpackGearTest.org for the opportunity to test the U.L. Comfort System. This report was created with the BackpackGearTest.org Report Writer Version 1.5 Copyright 2009. All rights reserved.